Just wanted to let you know that due to some extenuating circumstances, Turn It Up Tuesday will not be held this week. We will be back next week. Sorry about this. Save your posts and come back next week. Have a great week. Welcome to another week at You're The Star party. We have changed things up a bit and we are now showing each week's features on ALL of our blogs.You can check if you were featured below, then link up your posts. We can't wait to see what you will share. Welcome to the last Over The Moon Party for January. Can you believe it? If you leave a comment, let me know what the number of your post is so I can stop by and give a special comment.Thanks for sharing. So happy to have you join us at Happiness Is Homemade. We love seeing all of your ideas, crafts, DIY projects and amazing topics. Share your posts, send some love and check out all of the features from last week. With the Super Bowl right around the corner, snacks are on our mind. My problem with snacks are that they can be high in calories. So why not make something that is healthier. How about Chipotle and Black Bean Guacamole? Do you have an old pair of jeans or a jean shirt that you are getting rid of? I have a jean shirt that I was going to get rid of. As I was holding it, I had an idea - why not make something for Valentine's Day using it. Welcome to a new week on Turn It Up Tuesday! It is always a pleasure to have you join us this week, and every week! Thank you for partying with us and sharing all of your amazing posts. Welcome to another week at You're the Star. This week I am sharing some home features from last month. Check them out below. It's time again for the Over The Moon Party. I would love it if you leave a comment, let me know what the number of your post is so I can stop by and give a special comment.Thanks for sharing with us. Welcome to another week at Happiness Is Homemade. We are so excited to have you party with us and share your wonderful post. If you comment, leave me your post number/s so I can stop by and give you special attention. Did you make a New's year Resolution is get in better shape or to eat healthier? What about taking care of your skin? We all want to look our best and that includes our skin. As I am getting older, I find it even more important to take care of my skin. It is never too late to start a skin regiment and the sooner you start the better. Here are 6 Superfoods that are packed with skin-healthy nutrients to keep your skin glowing. We'd like to thank you in advance for partying with us and sharing all of your amazing posts with us. If you've been here before, thank you for coming back! And if you're new here...welcome! Feel free to share, share, share! We love having you! Welcome to Family Feature Week at You're The Star. Remember you can link up all month long. If you leave a comment, let me know your linkup number so I can stop by and give special attention. It's time again for the Over The Moon Party. I would love it if you leave a comment and let me know what the number of your post is so I can stop by and give a special comment.Thanks for sharing with us. Here we are in the middle of January. Hope you are staying warm with all of this snow and cold weather. Come inside, grab a hot drink and join our party. If you comment, please leave your post numbers so I can stop by for a special chat. We took the our four Dachshunds on a hike to the Everglades National Park after Thanksgiving. I know, I am so late in getting this posted, but maybe there was a good reason. As I began to write this post, I was looking at the pictures I was going to use. It was then that the sadness set in. We take our dogs with us everywhere and there was of course pictures of them. This one in particular made me cry. 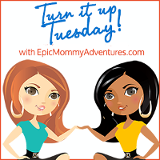 It's a new week on Turn It Up Tuesday!! Thank you so much for stopping by last week and sharing all of your posts - they were amazing. We'd like to thank you in advance for partying with us and sharing all of your amazing posts with us. If you've been here before, thank you for coming back! And if you're new here...welcome! Feel free to share, share, share! Welcome to Week #2 of You're The Star. We are so excited to have you join us. If you were here last week, I am so glad you stopped by this week to share your posts. If you are new here, welcome and I am looking forward to seeing what you are sharing. Remember if you comment, let me know what your post number is so I can give you a special comment and pin your post. Don't forget to check out this week's co-host for their features. It's time again for the Over The Moon Party where we pin every post. I would love it if you leave a comment and let me know what the number of your post is so I can stop by and give a special comment.Thanks for sharing with us. 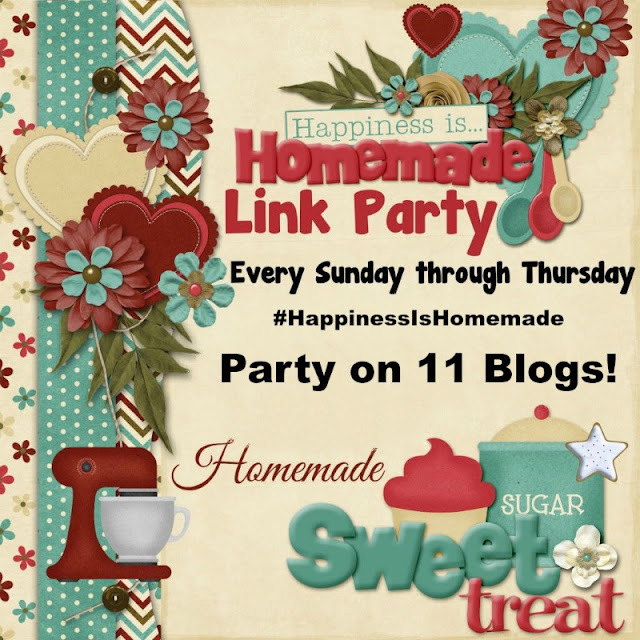 Welcome to the Happiness Is Homemade Link Party. We enjoy all of your creative posts that you share with us. Check out the features below and then link up your posts. I'm not a gadget person usually. I do not have lots of tools in the kitchen for baking, only the main essentials. Sometimes I see a fancy pan or mold that I like, but then I think, "how often would I really use it"? So I usually put it back. Are you like that or do you go ahead and buy it? Well, on a recent trip to JoAnn fabrics, I decided to keep the fancy pan. With this fancy pan, I made these adorable brownies. Can food be adorable? Happy 2017! It's a new year and a new week here at Turn It Up Tuesday. To celebrate the New Year, we'd like to continue celebrating by having you share some of your best posts in 2016 and for 2017! Share those posts nearest and dearest to you, the best family-oriented posts of the year, the best DIY crafts that you've done this year, your New Year resolutions for 2017 (and how you achieved your 2016 resolutions), and everything in-between! Mari chose Red Velvet Winter Cake from Howling at the Moon. "Red Velvet is my best friend lol." Mari chose Cherry Cheese Danish Braid from Reviews, Chews, and How-Tos. "And having food still on my mind I choose this other sweet treat by Lynda." Reuven & Aliyah chose A Mom's Guide to Minecraft - Join in the Fun! from our very own Tiffany from TheMrsTee.com. "This post gave some nice definitions needed to understand a wonderful & creative game that kids can play for hours (and that parents will want to play, too)!" Reuven & Aliyah chose When Breastfeeding Doesn't Go As Planned from our very own Melissa from The Healthy Living Mama. "It's very important for mothers to hear that not everything goes smoothly according to plan. Another extremely important lesson is not to listen to all advice givers. Even though they may mean well, their words may come across as mean and may not take your reality into consideration. This is a very useful and helpful post. Wish my wife and I had read this when we had breastfeeding difficulties with our first son." Natasha also chose this post. "I had a lot of difficulties with breastfeeding my son, and I felt so disappointed. It didn't help that many people told me that it was my fault why it wasn't working and that I had to work harder at it. I realized over time and through talking to loved ones, that everything doesn't go as planned sometimes. In the end, I had to make the decision to supplement breastfeeding with formula. These are definitely some great tips for other moms that be going through the same! Thanks for sharing!" Natasha Save $10 a month – Right Now! Buy your own Cable modem from My Family on a Budget. "Thanks for sharing! When I had cable, I also bought my own modem, and the savings were worth it. Great informative post!" The post with the most views is Black Bean Quinoa Casserole from Courtney's Cookbook. We won't be choosing the Best of the Best this week...but know that all of these posts deserve to be Best of the Best! Happy New Year and Welcome to 2017 and the first week of You're The Star. Come begin the year with us. Did you miss us? We missed you! We can hardly wait to see the creative ideas you have stored up to share with us this week but do you remember our party from 3 weeks ago?